Sarah Lahanky (left) and Ali Kazerani at the International Big Data and Analytics Educational Conference in Langkawi, Malaysia. A Dal CRMBA team won the grand final of the IBM Watson Analytics Global Competition this past weekend after placing first among 210 teams from 7 countries in a competition in April. Students in Dr. Michael Bliemel's Business Analytics and Data Visualization class had the option of submitting an entry to the contest in lieu of a term project. Teams used the IBM Watson Analytics tool to create visualizations, build a dashboard, and do predictive and social media analysis on an environmental issue, submitting a video based on their findings. 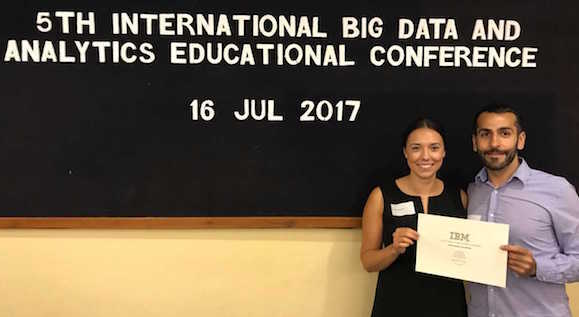 Winners were announced in May, and the top two teams travelled to Malaysia to present their work in person during the 5th International Big Data and Analytics Educational Conference in Langkawi. AliKazerani and Sarah Lahanky presented their project, "Examining the Relationship Between Economic Activity and Environmental Impact", on behalf of their team, and took home the win. The win follows another Dal success in the annual competition: last year a CRMBA team came in second. "We're thrilled that we won worldwide champion this year after getting first runner up last year," says coach Dr. Michael Bliemel. "We're also proud of the other 9 Dal students who placed in the top 10. Students all work very hard in the class on topics they are passionate about, and the results speak for themselves."